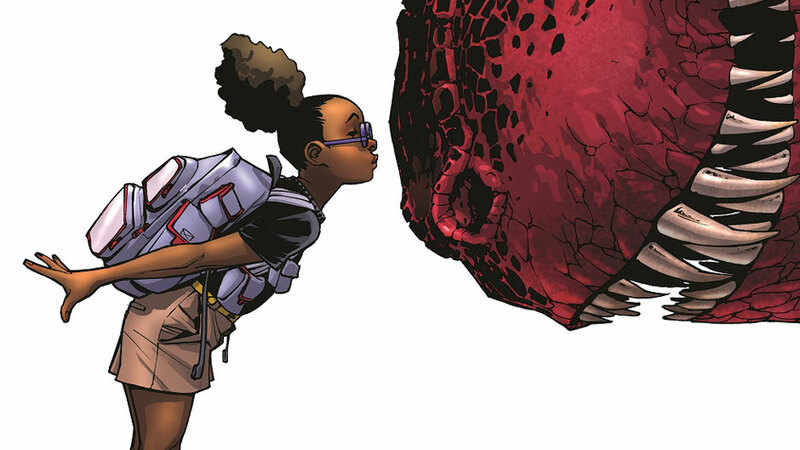 There have been times when Marvel’s writing has suffered due to the writers’ desire to make a political point and/or please the social media commenters, but Moon Girl and Devil Dinosaur does not appear to be one of those cases. At least not at first glance. I’ve just started the series, but I can tell this is probably a series I’m going to like. It feels a lot like Runaways and seems to take a step back from the mainstream Marvel Universe. It’s a little different than the standard superhero shtick we usually see. There was one trope I feared when starting this series, but thankfully I have not seen it. At least not yet. So many female/minority led series fall into the trap of creating a strawman political foil for the hero. Although these sorts of people exist, they’re so easy to write it can only be called a cheap attempt to stir up anger in the reader. But thankfully, I haven’t seen this over used trope just yet (keeping in mind I’ve only just started reading). The first few issues passed an all-important test: they were fun to read. Lunella Lafayette is sassy but not over the top, very much the way a real kid would act (except a real kid would probably be a little more scared if a dinosaur carried them off.) The visuals are quirky, the cave men are funny and the whole thing is tongue in cheek, not taking its self too seriously. I was already sold on this series, but the writers took an extra step to flesh out Moon Lafayette. Her work as a kid scientist isn’t just for the heck of it, she has an inhuman gene that she wants to change because she’s afraid of mutating into a monster. Whereas so many comics and cartoons of this sort just pick a kid and have something incredible happen to them, Lafayette is already an interesting character on her own without the addition of the big red dinosaur. Her fears make her instantly sympathetic when she loses the MacGuffin she expected to cure her.